Reduce energy usage: Remote asset management*,PowerNap software, Dynamic Dimming and scheduling features help eliminate excess energy usage. Boost productivity: Generous height, tilt and swivel adjustability help users of all sizes tackle those big, long projects in comfort. 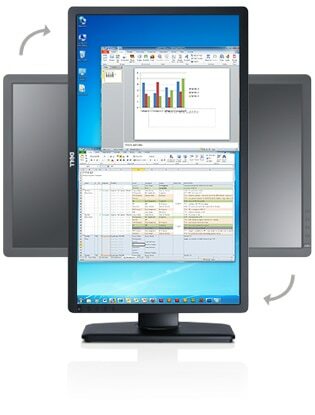 Create a healthier workspace: With an arsenic-free and mercury-free LED panel, the Dell Professional P2412H 24" monitor is designed to have minimal impact on your environment. 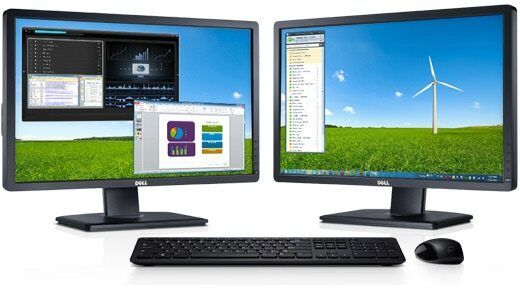 Work in wide-open spaces: Enjoy working in several windows at once with the benefit of a spacious 24" screen. See your work in a new light: Enjoy the excellent imagery provided by Full HD (1920 x 1080 (max.)) resolution and a high dynamic contrast ratio of 2,000,000:1 (typical). Make easy connections: Plug into productivity with a wide assortment of connectivity options, including DVI, VGA and USB ports for your peripherals. Businesses demand a great deal of flexibility, control and convenience, and that’s what you’ll find in each P2412H monitor. From wide-ranging height, tilt and rotation adjustability to optional remote asset management software*, you’ll find nice touches that can add comfort and save time. Adjust to fit: In addition to tilt, pivot and swivel adjustments, the P2412H offers increased height adjustment range of 130mm (5.12") over previous models*. Switch orientation quickly and easily: With enhanced menu rotation software, you can rotate your screen from landscape to portrait orientation, or vice versa, then follow the on-screen prompt to orient your on-screen content. It’s that simple. Manage remotely: Enjoy the comfort and convenience of troubleshooting, accessing, monitoring and managing multiple Dell monitors in different locations with optional remote asset management* capability. You’ll find plenty of energy-saving features in the P2412H monitor, including an arsenic-free and mercury-free panel along with ENERGY STAR® , EPEAT® and TCO certifications. Now when you take a break, your screen can too. PowerNap software dims the monitor to minimum brightness or puts it to sleep when not in use. When the images on your screen are predominantly bright or white, your screen will dim slightly to reduce glare and help save energy. See a visual representation of your energy usage quickly and easily with the energy usage bar in your on-screen display menu.